...for Texas, Mississippi and Louisiana. A tornado watch is already out (see below) in east Texas. Tornado warnings have already been issued. Here is the outlook from now until 7am CDT Monday. 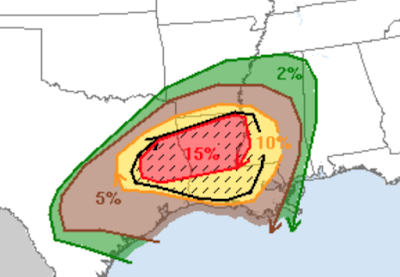 On the map above, the significant threshold for tornadoes is 5% (brown). The risk today is more than three times that level. In addition, the hatching means violent tornadoes are forecast. There is also a high risk of damaging thunderstorm straight winds in northern part of the yellow and red areas above, along with the likelihood of very large hail in the yellow and red areas. There is complete tornado information and safety rules at AccuWeather Ready.